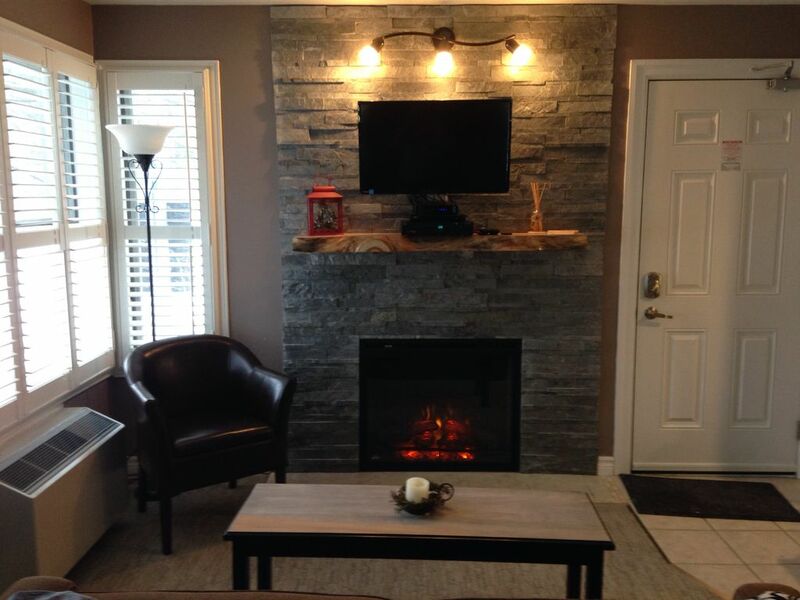 Beautifully updated studio condo at the base of Blue Mountain's North Chair, 10 minute walk to the Village or free shuttle service to the village shopping retaurants and activities, on site heated pool and hot tub, tennis courts. Dave and Jana were awesome to communicate with. Had zero problems with the room. Super clean. Easy access. Stayed for three nights over the holidays. Two adults and one child. The place is exactly as described but much better. Incredibly well thought out and every need considered. I wish all rentals were this well set up. Easiest arrival and departure. Just perfect. Very nice, clean and cozy. Pros: quiet area, very clean and well maintained, close to the slopes (pretty much right by the North Side lifts), close to the village (walking distance), close to pretty much anything you want to do. Very good location. Cons: (I have to point to some, but not significant) no washer or dryer may be an issue if you do a lot of sports activities and have no spare outfits for entire stay, a bit of noise coming from the upstairs unit as some people pointed out in previous reviews. David and Jana are great hosts and easy to communicate with. Highly recommended. Everything about this quaint little condo was perfect from the decor to the amenities. Communication with the owners was easy and everything was perfectly clean. Our ONLY complaint which was simply a matter of luck was the noise from other units. There were a lot of wedding parties around up late at night and then back at it first thing in the morning. However, we were provided with numbers we could call in this situation and simply chose not to be party poopers. We enjoyed our visit to Blue Mountain and our stay at this condo. The location is excellent, close to Scenic Caves, the Georgian Trail, Blue Mountain itself, etc. Our 7 year old loved the swimming pool (very warm water) and hot tub too, located on site. The condo itself has everything you need. The bed and the pull-out sofa are both very comfortable, the jacuzzi in the bath is a great addition, and the kitchen is small but complete. The one minor drawback was that partitions are somewhat thin in the condos, so we could hear the people upstairs as they walked back and forth, late into the night. But there was no loud music, and all in all we found other guests to be very friendly and respectful. This condo is a perfect option for a couple, small family, or group of 2-3 people.